Silver spot prices staged a strong recovery yesterday, and like many other commodities, ended the trading session firmly higher with a wide spread up candle, but which failed to have sufficient momentum to break and hold above the 40 day moving average. Whilst gold and silver prices tend to correlate closely in the daily price movements, the technical picture at present for the two commodities is slightly different. While spot gold remains firmly bullish as yesterday’s surge higher gave us two bullish signals, the first being a bullish engulfing candle, and the second the support provided from the 40 day moving average, both excellent signals, the same does not apply to spot silver. 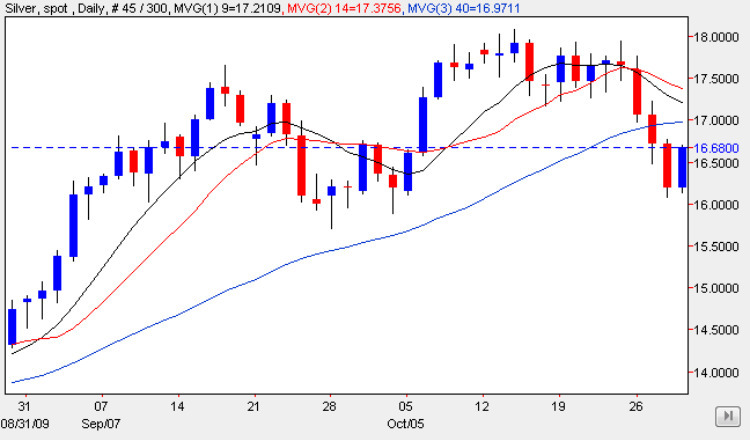 Firstly, yesterday’s candle failed to engulf the previous day, and secondly silver prices remain well below the 40 day moving average, and indeed from a technical perspective the chart would be considered to be bearish as as a result. However, there is a positive aspect for spot silver in that the low of yesterday found support from the recent consolidation which sits above the $16 per ounce level, although ahead lies a deep and sustained area of congestion which will require considerable momentum to penetrate. The momentum to break higher may well come from gold, which looks set to break higher into new ground in due course, and as a result should drag spot silver through this stiff resistance area. Technically, of course, if we were trading the silver chart in isolation, then the picture is more bearish than bullish at present, but given the evident strength in the daily gold chart, the influence of the precious metal cannot be over stated, and therefore based on this I would suggest that silver prices should rally in due course, and break above the deep congestion, provided gold continues to sustain its bullish momentum.